So this is the new version Studio Ghibli. No longer producing feature films on their own, they're now an animation collaborator, working with global production companies and filmmakers to help animate their stories. 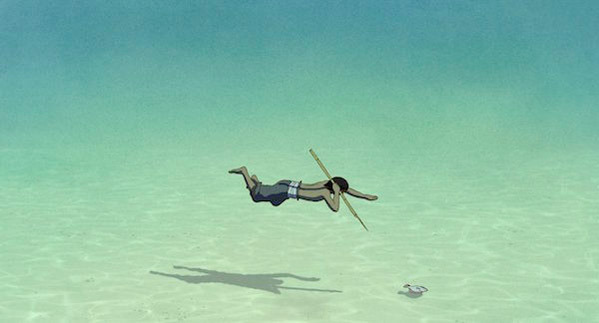 While this news was first reported in April (by Screen Daily), a few weeks ago Studio Ghibli in Japan announced that they're co-producing, with French distributor Wild Bunch, an animated movie called The Red Turtle. Dutch-British animator Michaël Dudok de Wit is directing, along with Japanese animation legend Isao Takahata working as Artistic Producer. Studio Ghibli will release the film in 2016 in Japan. "Around the time of Ponyo I visited Studio Ghibli," recounts Maraval, referring to Miyazaki’s 2008 film. "Miyazaki showed me Father and Daughter and said 'I want you to find [Michaël Dudok de Wit] for me'. I said that would be complicated. He replied, 'If one day Studio Ghibli decides to produce an animator from outside the studio, it will be him'. The description for The Red Turtle calls it a "fantastical tale" about a "man marooned on a desert island whose attempts to escape on a raft are thwarted by a giant turtle that sinks the makeshift craft." Dudok de Wit co-wrote the screenplay with French director Pascale Ferran, best known for Lady Chatterley and Bird People. As exciting as it is knowing that Studio Ghibli is involved, this isn't exactly a "new Ghibli movie". 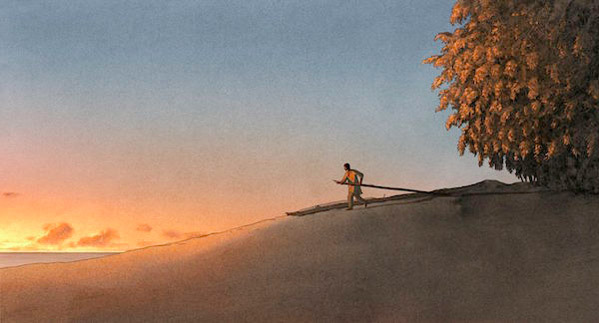 The latest report (via Kotaku) states that Dudok de Wit temporarily relocated to Tokyo to finish the story and storyboards, with Takahta overseeing everything. However, the film is now being animated in France with plans for release in Japan in September 2016. Don't forget, Ghibli had to let most of its animators go, and it's not economical of them to hire most of them for just one project. These are all the details for now. We'll be keeping an eye on this project, and anything Studio Ghibli is involved with. For now they seem to be laying low, focusing on their filmography, and a few projects like this and Miyazaki's shorts for the museum. When Studio Ghibli developed the Playstation 4 game, NI NO KUNI, I knew there was going to be something new happening with them. This is a little sad, but mostly great news. Their style will live on!! The Old Ghibli movies hopefully will become like Grimms Fairy Tales of a sorts in hundreds of years, they are beautiful masterpieces. This movie seems to be cel shaded 3d, which is advancing fast, but won't have the look of the old movies. Ghibli have created some of the greatest visual storytelling in cinema, I don't mind so much that they are gone in the older form. Everything dies, some things are reborn. I love that the French and Japanese pursued a different approach when everyone else wanted the Pixar look. I still think Tekkonkinkreet is one of the best examples of the interaction between a 3d texture environment and digital cel painting or even Mindgame in it's approach being quite experimental. I welcome any new animations, as long as the story and characters are able to pull me in. I had noticed a lot of French animators had done work for Cartoon Network recently, which is good. With shows like Adventure Time doing so well maybe things will change a bit in the States too. I'd started to watch Adventure Time with my son, after going through the hell of watching some terrible children's shows with him as a really young child. The stories are really interesting for a kids show, I like the world it's set in. It's the system that makes Adventure Time I find interesting, from what I've read the artists have a lot of input into the episodes, instead of a board of executives like a lot of more sanitised tv shows. the shows I watched as a kid were held together with sellotape they were so wonky, apart from Scooby Doo or WB and Hanna Barbera ones, but I did enjoy Ren & Stimpy as a teenager, then found out about Ralph Bakshi later on. I'm just glad to see animations that aren't shiny 3d puppets , it's good to have some variety.